For the 35th consecutive year, art lovers and collectors will gather at the La Quinta Arts Festival, Thursday through Sunday, March 2, 3, 4, 5, 2017 for the ultimate annual fine art and culture experience. Produced by the non-profit La Quinta Arts Foundation, La Quinta Arts Festival hours are 10am to 5pm daily, and admission is $17 for a Single Day Ticket, $22 for a Multi-Day Pass, and free for children 12 and under. Tickets may be purchased online at LQAF.com, the best option to avoid long lines – or at the Festival gates. Set at the stunning site of the La Quinta Civic Center Campus, 220 La Quinta Arts Festival artists will arrive from 40 US States, Argentina, Canada, Czech Republic, and Nicaragua to display their amazing original art on lush grass, surrounded by sparkling lakes with a majestic backdrop of the Santa Rosa Mountains. 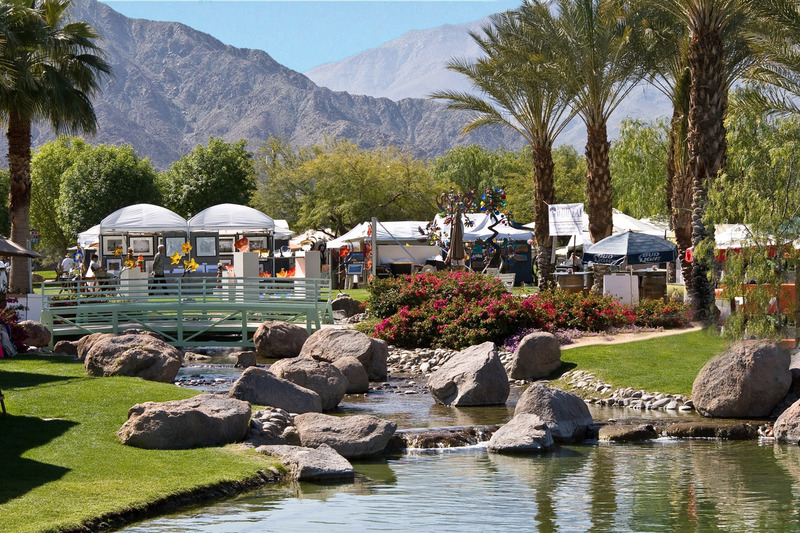 Named #1 Fine Art Festival in the Nation by Art Fair SourceBook (2013, 2014, 2015) and #3 in 2016, the La Quinta Arts Festival annually serves over 22,000 discerning art patrons – with over 46% making the event a destination, traveling from 45 US States and internationally, while 56% are repeat attendees. Drawing from the 35th Anniversary Festival Poster by artists Signe and Genna Grushovenko, (South Carolina) the 2017 Festival theme is ‘Make A Splash.’ Look for new, unique experiences and art installations in the Splash Lounge and throughout the event, presented by La Quinta Arts Foundation’s visual and performing art scholars. La Quinta Arts Foundation has awarded $1.23 million in college scholarships to 376 emerging art professionals from La Quinta Arts Festival proceeds. We are also excited to see the 35th Anniversary cake being created and presented by the La Quinta High School Culinary Arts Program. For more interactive fun, patrons are invited to snap and post a photo with their favorite Yarn Bomb installation contributed by local community creatives, and participate in a Beach Ball Treasure Hunt hidden throughout the event which can be exchanged at the Festival Shop for the 35th Anniversary Commemorative Poster (value of $35). What’s a festival without superb food and drink – and – as usual La Quinta Arts Festival delivers with specialties from Ruth Chris Steakhouse, Fisherman’s Market & Grill, E Pels Italian Ices, Brandini Toffee, and more. For the health conscious, we welcome So Delicious Dairy Free offering coconut and almond based dairy free treats. Stella Artois is the event official beer sponsor, served beside fine wines, specialty coffees and other libations which are sure to delight. Live entertainment and performance will be enjoyed in the amphitheater from 2pm to 5pm with notable headliners Horace & the KG’s bringing upbeat R&B on Friday, the ever popular Mike Costley, crooning jazz and standards on Saturday, and Steve Madaio Band will have the crowds swinging closing out the event on Sunday. Milton Merlos and Scott Carter will delight audiences with their guitar stylings each day. IAMNOTADJ will be spinning eclectic ‘house’ music in the Splash Lounge. La Quinta Arts Festival is proud to announce a new partnership with Tesloop who will offer a first-class stressfree transportation experience for patrons traveling to the Festival from Los Angeles and Orange County. Visit our website for details and a discount code. Membership with La Quinta Arts Foundation has its privileges – including festival tickets and invitations to member’s only events. Visit LQAF.com or call us to learn more. About La Quinta Arts Foundation/La Quinta Arts Festival Produced by the La Quinta Arts Foundation, La Quinta Arts Festival, top ranked fine art festival in the nation, raises funds for the Foundation’s non-profit mission of Promoting & Cultivating the Arts. Event proceeds have to date funded LQAF Visual Art Scholarship awards totaling $1.23 million to students pursuing an education in the visual arts. The 35th Annual La Quinta Arts Festival is scheduled Thursday through Sunday, March 2-5, 2017 from 10 am to 5 pm at La Quinta Civic Center Campus, 78495 Calle Tampico, La Quinta, CA. Tickets are $17 Single Day, $22 MultiDay, Children 12 and under are free.